I've been meaning to share this salad with you for a couple of weeks now. This is one that I pulled together from some fridge remains before I left to come away on my trip, inspired by a recipe from Maggie's Kitchen , by Maggie Beer. Maggie is one of my favourite chefs - I love her down to earth approach to using seasonal, fresh ingredients, putting them together in ways which are sometimes surprising, and presenting them in a simple, no-fuss way. This salad is a great example of that - the original recipe called for a combination of beetroot, blood oranges and pumpkin, together with witloof and watercress. I was really intrigued by this combination and had the recipe bookmarked for making when blood orange season comes around, and that I will do, but in the meantime I had some beetroot, pink grapefruit, pumpkin, rocket and goats cheese to use up and so this salad was born - thanks for the inspiration, Maggie. Maggie's original recipe called for boiling the beetroot, as opposed to roasting them as I've done, and she also serves the salad with a scattering of crispy sage leaves over the top, which I didn't have. You can find Maggie's original recipe here. Preheat oven to 200 degrees C (400 degrees F). Place the beetroot quarters and pumpkin wedges into a roasting pan, drizzle with a little olive oil, and sprinkle over flaky sea salt and freshly ground black pepper. Toss everything to coat well, and put into the hot oven for about 20-25 minutes. After this time, check the vegetables - the pumpkin should be cooked through and coloured, but still firm. The beetroot may, however, need a little more cooking. If so remove the pumpkin, set it aside, and return the beetroot to the oven until fork tender - maybe another 10-15 minutes. Once all the vegetables are cooked, put them into a large bowl. Remove the skin and all the white pith from the pink grapefruit. Then, working over the bowl containing the vegetables and using a sharp knife, cut down in between the membranes to remove the segments of grapefruit flesh. Let each segment drop into the bowl as you work, and then once all segments have been removed, squeeze the remaining membrane over the bowl to extract any juice. Add the rocket leaves to the bowl. Make the dressing by combining all of the dressing ingredients in a small screw-top jar. Shake vigorously until everything is well combined, then taste and adjust any seasoning as necessary. Pour enough dressing over the salad to just coat everything. Toss well to combine, and then put everything onto a large serving platter. Scatter the cubes of goat's cheese over the top and serve. This is a great autumn salad, best served slightly warm or at room temperature. The earthiness of the roasted beetroot, combines well with the pumpkin, and the peppery rocket, citrusy tang of the grapefruit, and sharp saltiness of the feta compliment the vegetables well. The inclusion of the feta helps also I think to make this a complete meal. I am sharing this post with Cookbook Sundays over at Mom's Sunday Cafe - maybe you'll feel inspired to get one of your cookbooks down off the shelves and get cooking! 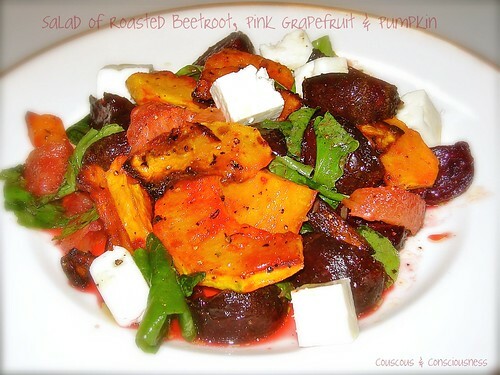 I'm also sharing this post at Food on Friday:Beetroot hosted by Carole at Carole's Chatter. 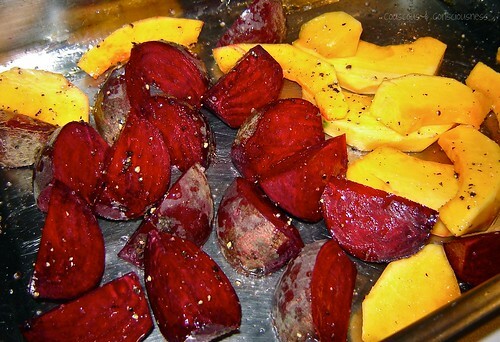 Great idea to roast the beetroot in the oven. Thanks Andreas - once you've roasted beetroot, you'll never turn back. Personally it's my favourite way of preparing beetroot. 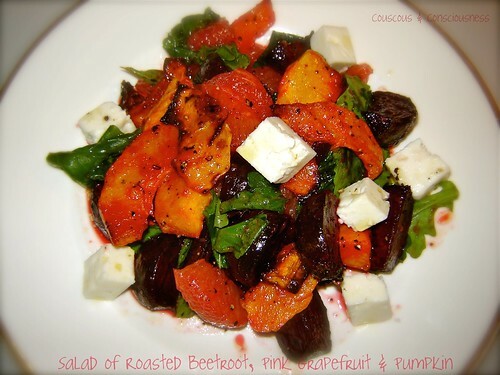 Hi Sue, hope you are loving the Greek Isles :) This salad sounds wonderful, the sweet beets & pumpkin, tangy feta & fruity grapefruit...and so lovely & bright in Winter. Hi Mairi - I am totally loving the Greek islands - this is a real little piece of paradise. Yes, definitely makes a great winter salad. Sue, what a beautiful salad and the flavor combination is wonderful! Thank you for sharing this wonderful recipe with Cookbook Sundays! It's so beautiful, I just love all the deep colors. I can just imagine how awesome it would look using the blood orange, as well. Sounds great! I love the colour of this salad. Beautiful and looks so good! I love pumpkin, especially when they are baked, so full of flavour and delicious! Thank you for sharing this lovely salad! Thanks Joy - yes, baked pumpkin is great and it makes such a great addition to so many dishes. Hi Tina - thanks so much for visiting and taking the time to leave a comment. What a wonderful combo of flavors! I am craving this now! Thanks so much Gwen - yes it is a great combo, and one I think you would really like. first time here...love your space..very interesting posts..excellent clicks..
Hi Jay - thanks so much for visiting and your lovely comment. Kitchen Belleicious - thanks for visiting and for taking the time to leave such a lovely comment. Fruit, seems so often to find its way into many of my salads. Oh did you see my olive oil giveaway! you would Love it! the link is below! Grapefruit and pumpkin...now that is a combo I've never thought to try before! This sounds delicious! I love the idea of adding grapefruit to this salad. There are some lovely strong flavours in here! Hi Joanne & Corina - the grapefruit and pumpkin was a surprising combo, but it seems to really work. I think the blood oranges if you could get them would be even better. with summer comming up all i want is fruits and salad, this is juts right perfect for me! love the colours! Thanks, Ananda - yes, I think this would be a perfect salad for you to enjoy at this time of year. Hi Aarthi. Thanks for visiting and taking the time to leave a comment. Hope you'll find the time to stop by often. Thanks, Kankana. I love roasting veges too - seems to really intensify their flavours, and I love them the next day for using in salads. Thanks for visiting, and following. I hope you'll stop by often. This is a stunning dish and it sounds delicious. Would you believe, I have never had beet root. My Mom used to make a phenomenal beet leaf soup. Thanks, Chaya. Gosh, I can't believe you've never eaten beetroot. Here in New Zealand it's probably really only been in recent times that people have tended to experiment a little with using the leaves, and it's rare to be able to buy beetroot with the tops on, so really only something you can enjoy if you grow them yourself. This looks and sounds delicious! Hubbys bringing home a whole box full of freshly picked pink grapefruit when he returns from work next week! I can hardly wait... I LOVE them! The Greek Isles... you lucky thing! Thanks, Emma - I totally envy you getting a whole box of pink grapefruit. The ones we get here always seem to come from Australia, and are a fairly ridiculous price, but I do love them. I love roasted beets. It's great how the sugars caramelize in the heat and sweeten them up. You're exactly right, Dan, and it is by far my favourite way to eat beetroot. 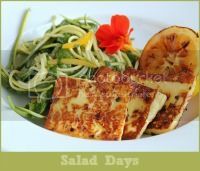 I love everything about this salad - another one Ihave to try! Thanks so much, Mireille - I hope you enjoy it as much as I did.